Western culture is becoming increasingly technological. It seems in be an unavoidable (and inescapable) trend. Critiques of technology are becoming a bit more frequent, but what I want to do is begin to examine a disturbing sociological trend: the issue of technology in conjunction with personhood. Personhood is a topic familiar to those who study ethics. The issue is centered on the abortion debate (namely, at what gestational juncture does a fetus become a person?). However, personhood is rarely spoken of in relation to technology. Yet the personalization of technology is becoming common. Most recently, the latest version of the iPhone has a feature named Siri which literally talks back and at you. It can (even if meant in jest) tell you it loves you, it cares for you and other such personal sentiments. What I want to do in this series (a yet undetermined number of installments) is examine the trend of the personalization of technology while culture simultaneously negates personhood of the unborn. We do not yet (thankfully) have walking, talking robots. But (science) fiction has prophesied cultural trends in the area of technology and robotics. For those that know me, you are aware that I am quite the admirer of the fanatic science fiction series, Star Trek and Star Wars. These series, especially the former, go to great lengths to portray issues of ethics, personhood and technology. Thus, because we do not yet have robots serving us coffee, I will rely heavily on trajectories portrayed in these series to draw analogies seen in today’s discussion of philosophical ethics. Personhood can be defined in several different ways. Edward Johnson states that it is the “condition or property of being a person, especially when this is considered to entail moral and/or metaphysical importance. This seems straightforward and would generally raise few objections. However, it is unclear how artificial intelligence would meld with this definition. One does not, however, have to look much further for traits of personhood, for Johnson himself gives several characteristics of personhood which include: agency, reason, language, volition and a basic subject-object relationship. Even the most up-to-date technology available does not meet all of these basic requirements. For example, the new Siri feature of the iPhone does not have volition, yet does have the ability to communicate via language (or features that resemble language). For example, the phone cannot turn itself on or off. Further, Siri only responds when commanded to, thus lacking a volitional aspect to its inception. Data is one of the most popular character in the Trek franchise (which at five series and over 700 episodes is quite a feat). What is endearing about Data is his comical, yet desperate, failures in his attempt to become more human. Eventually, Data achieves emotion and, in the last film to feature his character, Data sacrifices his own “life” to save his comrades. At such an event, his friends do not mourn the loss of a computer, which is essentially what Data is. Rather, they lament the death of a friend – someone they loved. 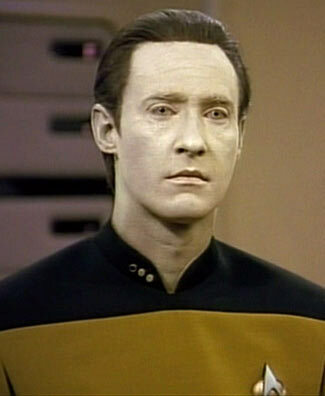 People cheer for Data; they want him to succeed in his endeavor towards humanity. The viewer of Trek empathizes with Data and the writers portray him as a sympathetic character. Data embodies personalized technology. While he physically resembles a human male, he does not possess actual human body parts. He has no brain, but a positronic brain; no heart, rather complex circuits. He is not a member of species homo sapiens but a machine. But this machine is special – he is treated as a person. Society is moving in this direction, yet is moving further away from granting personhood to members of the human race. I will attempt to present philosophical and sociological faults with this proclivity in future installments. In such writings, I will rely heavily on Data, and Star Trek: Voyager’s holographic (and unnamed) doctor for examples. Part two will feature human hesitation towards granting personhood to technology. Edward Johnson, “Personhood,” in The Cambridge Dictionary of Philosophy, ed. Robert Audi (New York: Cambridge University Press, 1999), 662. I look forward to reading this series. I would also enjoy, at some point, discussing some of these issues with you in person. I think continual interaction with others via technology without regarding their personhood face to face only serves to perpetuate the depersonalization of humans. Granted sometimes it is the only means available, but more often than not nowadays this is not the case. To worsen matters society attempts to convince us that the lack of human contact should not be a source of lament. Even John lamented such absence of presence in his letters 2000 years ago and emphasized the importance of being face to face, “but I trust to come unto you, and speak face to face, that our joy may be full.” (2 Jn. 1:12) It seems technology has enabled us to supplement human interaction where it is not necessary or healthy. I definitely cannot plead innocence in this matter either. I would much rather fire off an email or message for convenience sake over interacting (even via phone) with others. Thanks for taking on this daunting topic! Thanks, Debbie. It is something I have been mulling over for some time and hope to turn into an academic paper at some point. I would love to discuss the issue in person, given that we have been blessed with close spatial proximity. Hopefully putting this online will give others a chance to read about this who are unable to talk in person. Does God thus then depersonalize His relationship with us by communicating with us through the technology of the codex? This looks like a potentially profitable series of blog posts, Michael. I like to use STTNG: “Measure of a Man” in my Intro to Philosophy classes after a discussion of Plato’s “Apology.” AND…as you might know, consciousness is a big issue in contemporary Philosophy of Mind; consciousness seems to have been the one condition sine qua non for personhood that Cmdr. Maddox couldn’t rule out in this episode. One of the big issues in the debate, of course, is whether or not consciousness is either a materially reducible phenomenon, or a supervenient property, or something stronger. I guess some of my questions for you at this stage in the game is this: Do you see consciousness as a similar necessary condition for personhood? And do you make a distinction between the ontological cagegory of personhood and the existential category of the self? Erik: Somehow your reply to my post on technology got flagged as spam. Sorry; I’m not sure how that happened. I love that episode of STTTNG and hope to use it in the future. I’ve thought of consciousness as a necessary condition for personhood, but recognize its problems. As for your second question, it is not one I have previously thought of, but will now for sure. Thanks for your response! I look forward to more dialogue. Steve: I am a bit puzzled by your question. First and most directly, I would say no. Second, I am not sure how this directly relates to the issues raised. Perhaps I should have clarified what I mean by technology. Technology, in general, can mean many things: transportation, food preservatives, computers, etc. The limited scope of technology I will be using is focusing on the advancement in robotics and the digital movement. I have no plans to integrate much theology in this examination. As I said, my focus will mainly philosophical and sociological. I may at times draw on theological issues and the Christian worldview, but will not limit the discussion to those things. I hope to have Part II up today. Good to see this thread emerging, but not sure how the discussion can proceed very far without approaching it theologically, per the previous response (though I admit my biases!). However, sticking to a more philosophical approach, have you interacted with John Macmurray’s work, particularly “Self as Agent” and “Persons in Relation”? Thanks for your comments, Dr. Payne. “Persons in Relation” is on my reading list! Knowing me, I will probably have some discussion relating to theology, but I do not want it to be extensive. This is not to say that theology has no input into the discussion. Rather, I want it to appeal to a wider range – not just Christianity. I would love to hear your thoughts on the issue in relation to theology. Further, theology will likely be embedded into my posts. I have ideas for future installments that will hinge on Thomistic and Kierkegaardian thought. Obviously, those two men were theists, and thus theology will be seen, but it will not be the primary approach.